So, the prophecy I made in this post about skiing powder for the rest of the season has so far turned out to be true. The last two weekends I've been in Hemsedal, and (especially last weekend) I've been skiing pow. Let me explain about Hemsedal. Although Oslo is a great city in many ways (big but not too big, great groomed cross-country skiing in the forest in the winter, great mountain biking in the summer, the Opera house, etc) it is, by Norway standards, really far away from the mountains. 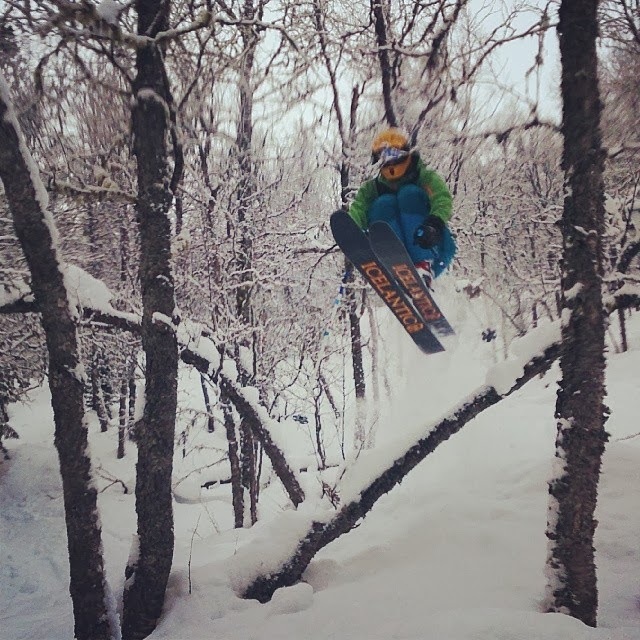 Hemsedal is the nearest ski area of any size, and the result of this is that everyone in Oslo who likes to go goes there nearly every weekend in the season. It's a three and a half hour drive each way (oh, the CO2 footprint! ), and if you leave Friday afternoon you get to sit in traffic with the rest of Oslo. We solved the traffic problem two weekends ago by leaving at 6 am from Oslo. We clicked into our skis and bought lift passes by 10. The conditions that weekend were pretty good, there was some harder snow under but 10 - 20 cm of powder on top which kept it fun. We skied a couple of laps in 'Gummiskogen', the forest on the backside of Hemsedal which, for some reason is name the Rubber Forest. Then we had a nice hike up to 'Reidarskaret'. We meant to hit a fairly gentle sloping couloir, but we entered it wrong and so ended up skiing a steeper face. Luckily the snow was great, although most of the powder sluffed down with us on the first run - I'm not sure it would have been as great a second time around! ... but somehow turned out fine! The next weekend there was an absolutely enormous amount of snow. It snow basically the whole weekend, so we mostly skied in the trees. Unfortunately, I misplaced my camera and have no (!!) pictures. It's ok, they would make you too jealous anyway. The conditions were the kind were you feel kind of invincible, because falling down is like landing on a soft mattress. Except for the places were the powder is so deep you basically get buried and have to dig yourself out. Yes, that happened. To more pow in your (and my!) future.